Is it a shirt, a tiger or a highway? All these things have stripes, which is the focus of this information writing prompt. 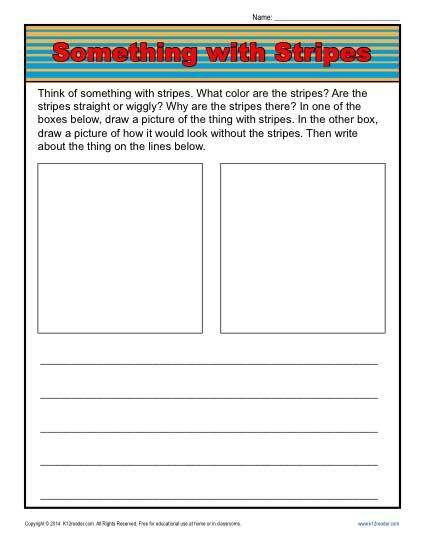 There is space in the worksheet to write and to draw different pictures of the “stripey” thing. Instructions for the activity read: “Think of something with stripes. What color are the stripes? Are the stripes straight or wiggly? Why are the stripes there? In one of the boxes below, draw a picture of the thing with stripes. In the other box, draw a picture of how it would look without the stripes. Then write about the thing on the lines below.” You’ll like it for practicing Common Core Standards for writing, although it may be helpful for other students.